Welcome to WA1MBA's home pages. I hope that this site will become a source of enjoyment and information for you. The primary purpose of this site, and this domain for that matter, is the promotion of amateur radio microwave activity. I may add, from time to time, other items as I see fit. If you know of some interesting site, please send me a message at . Some of the items below have sounds associated - click on the item, and your browser should download the sound and play it for you - sometimes this takes a while, sounds can be larger than images. I was originally licensed as K1URO in 1962, but I let my license lapse. Back then you did not get your old call back when applying for a new license. I was in the Navy, working as a Radioman on CW circuits, and decided it was time to go for the test while the code speed was up. I was lucky enough to get a pleasent call sign, easy to remember. We Are One'v Microwave's Biggest Advocates. Years later I finished grad school and could afford to get on the air again. I found the HF bands to be far too crowded (and too many lids) and so I got into satellites. This was a nice challenge, and also offered DX opportunites. While improving the satellite station I started to learn about microwaves, and decided that my next challenge was to get a house on the top of a hill. Years later I did, and have been working the microwave bands ever since. I am active from FN32SL94UH70 - Shutesbury MA, 80 miles west of Boston. I am on 144, and 432 through 10GHz from home at 1305 ft asl + 70 ft of tower. (Working on getting 50 and 222, and 24 GHz maybe soon). I f you want a picture of the location from space, click here. The long driveway runs north to the house, which is in the central left part of this image. The resolution is not good enough to show the tower. The home station consists of a Kenwood TS950SDX as the IF radio, followed by an SSB Electronics LT2S 144 MHz transverter. This acts as the IF for the microwave transverters. I use 2 x 7289 type amplifiers for the low bands (903 and 1296) and solid state amps for 2304 through 10G. I have amplifiers mounted on the back of the dish (see the picture above) for 2304 thru 5760 to put 10 watts into the feed on those three bands. The 10G amp is on the back of its dish, running 1 watt. Over the last few years, WB1FKF, W1RIL and I have been running scheds several times a week. We have been accurately measuring the propogation between our QTHs, and recording the weather. As I have reported in the Eastern VHF conference in 1994, there is not a strong corrleation between propogation and weather (temperature, dew point, time of day). There are, however, interesting propogation changes in rain due to rain scatter. Here is a breif recording of WB1FKF as received at my station on 10ghz rain scatter (200K sound file) - 100K compressed sound) - one summer day in 1995. We had thunderstorms this day. N1BWT (now W1GHZ) and I worked on rain scatter March 6th 97 with 52 signals, but by the time I got the tape recorder, the signals fadded to nearly unreadable. Here is his callsign sent twice, can you hear it? There are windmills on the side of the hill that we use for knife-edge diffraction. Here is a sample of the disruption that windmills can make on 10GHz. I have been asked whether snow can scatter 10ghz signals, and indeed it does, so here is some 10GHz snow scattering from January 1997. 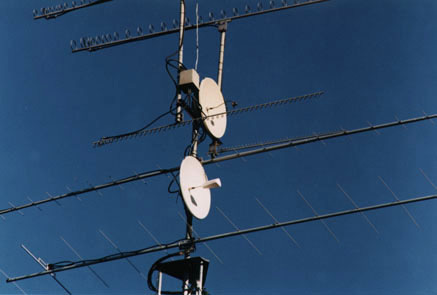 Please read CQ VHF February 1997 for a brief popular article I wrote about 10G propogation. One of my areas of interest is EHF - the frequency bands between 47 and 250 GHz. I have participated in two of the first amateur contacts on the 120 Ghz and the 145 GHz bands. For a while WB2BYW and I held the world records on 145 GHz and 120 GHz (at a mere 1.15 Km). Both of these have been broken over the years. It is a pleasure to see other hams experimenting with these bands. WA1ZMS effort is most notable . 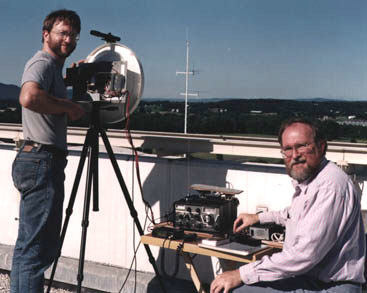 The photo below shows us setting up for the 120GHz contact from the roof of a building at the University of Massachusetts - Amherst, MA campus. Jim Mead - WB2BYW on left, Tom Williams - WA1MBA on right. Our 145 GHz contacts were made using about 1 microwatt, and the 120 GHz contacts had about 10 microwatts. We used the same dishes, which were optimized for a higher frequency and the feeds were close to cut-off at 120, so although our system margins could have been much better on 120 than on 145, the poor antenna performance limited us to just 1.15 Km (enough for a "valid" contact, but not much more). Folks ask me "What's next?". Right now I am working with others to get on the 240 GHz band, and am building up a narrowband 47 GHz station. I will let you know if and when anything interesting happens. Here I am at the July 1997 NEWS (North East Weak Signal Group - see other interesting sites). 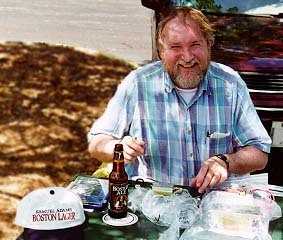 As you might notice, I am fond of Boston Brewery products. At this meeting folks were showing their construction projects, and I was showing 2, 3, and 5 GHz preamps and 2, 3, 5 and 10 GHz power amps. I also managed to enjoy a frosty or two.